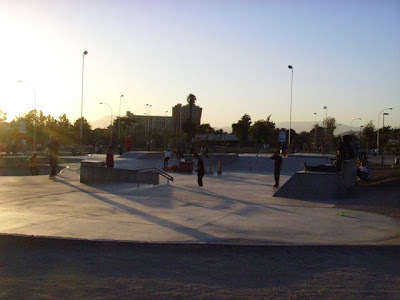 Maipú, Santiago, near the municipality outdoor swimming pool. 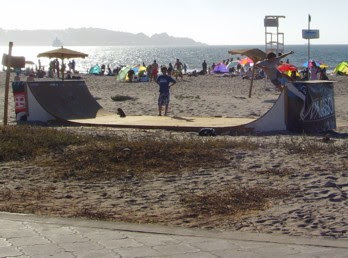 The kids who skate here know the true essence of skateboarding. 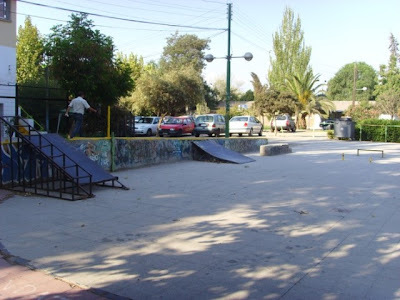 Just down the hill from this is Plaza Maipú, immediately next to Pajaritos (main road and extension of Alameda). 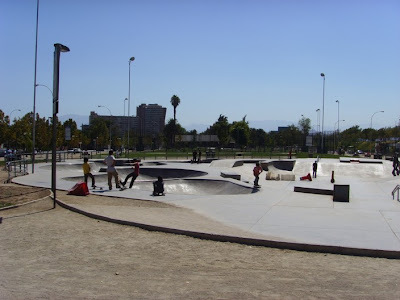 Plaza Maipú has good flatground, not really anything else. Maipú, Santiago, neben dem Freibad bei der Stadtverwaltung (Municipalidad). Die jungen Skater hier kennen das wahre Geheimnis des Skateboarding. Gleich den Berg runter ist ein Platz, Plaza Maipú, neben Pajaritos (Hauptverkehrsstrasse und Verlängerung von Alameda). Am Plaza Maipú gibt es guten Flatground aber sonst eigentlich nichts. 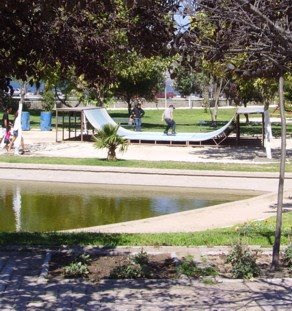 Maipú, Santiago, al lado de la piscina descubierta y cerca de la Municipalidad en Maipú. 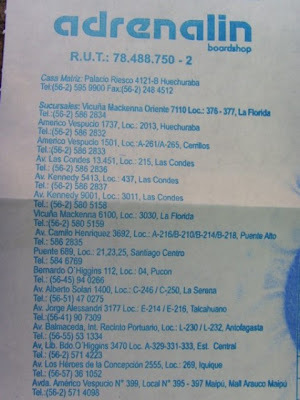 Los niños que patinan alla entienden la onda de skateboarding jaja. Abajo la colina es la Plaza Maipú dónde mucha gente patinan pero no hay nada excepto el suelo plano. Die Kante hier ist jetzt neu gemacht. 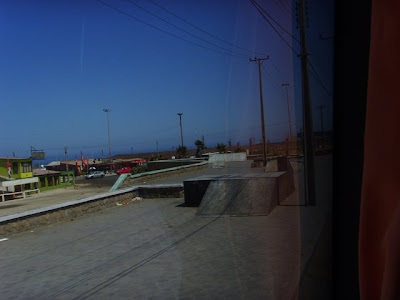 This is immediately next to the SKATE PLAZA, a super smooth usually all empty clean square. Dieser Platz ist genau neben dem SKATE PLAZA, super smoother Belag und normalerweise völlig leer und sauber. 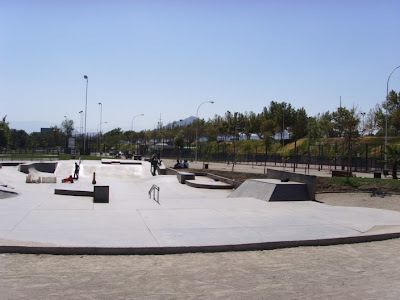 Esta plaza es al lado del SKATE PLAZA. El suelo es muy plano y normalmente desierto y muy limpio. 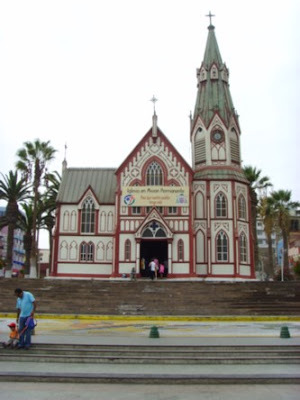 Maipú. Many squares look great from the distance but the surface is quite rough. Maipú. Man sieht oft vom Bus aus coole Plätze, die wie gute Skatespots aussehen, aber der Boden ist oft ziemlich rauh. Maipú. 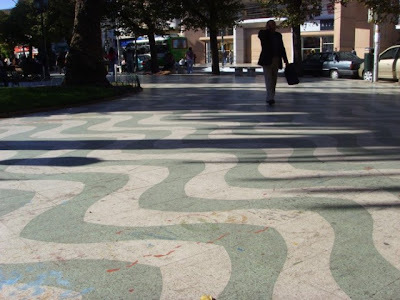 Frecuentemente ves plazas que parecen ser lugares muy buenos para patinar pero el suelo normalmente es muy áspero. Normaler Gehwegbelag im Zentrum von Santiago. Die Locals skaten da drauf. In case you need nuts for your trucks, then only place I could find them was a Chinese fake skate shop in the same mall as Diamond Skate. Falls du Muttern für die Achsen brauchst, würde ich zu Portal Lyon gehen, die Mall, wo auch Diamond Skate ist, ganz oben gibt es einen chinesischen "Skate" Shop. Das ist der einzige Laden, der solche Muttern hatte. Si necesitas tuercas para los trucks, va al Mall Portal Lyon (dónde es Diamond Skate también). 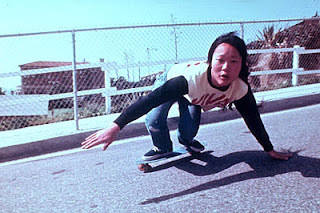 Más arriba hay una tienda de "skate" china que parace ser el único lugar que tiene estas tuercas. the only "real" skateshop I've seen. Santiago. Adrenalin is a chain of skate shops all over the place. Many malls have one. 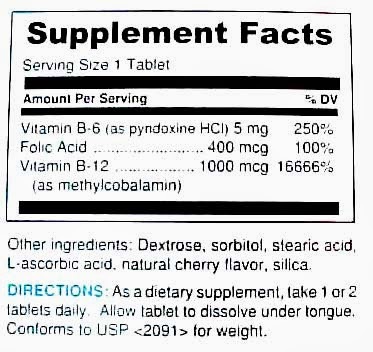 There are more than are listed here. Adrenalin ist eine Skateshop-Kette, so ungefähr wie Titus. Es gibt einen in vielen Malls, und die hier aufeglisteten sind glaube ich nicht alle. Hay muchas tiendas Adrenalin en todas partes en Chile, por ejemplo en muchos Malls y hay más que son listadas aquí. 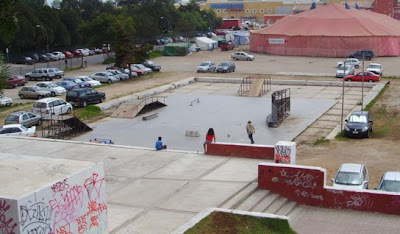 There is a skateshop and a big square there where people skate. Neben der von Eiffel designten Kathedrale ist ein grosser Platz, auf dem viele skaten. Es gibt da auch einen Skateshop. 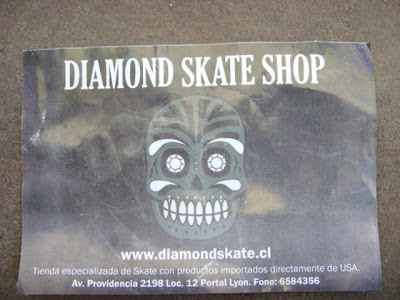 Al lado de la catedral hay una tienda de skate y una plaza muy buena para skate. Oh and you might want to check out Roboteam, a friendly neighbourhood vegan straight edge skateboard militia. Roboteam ist ein vegan straight edge Skateboard-Kollektiv in Chile.